One of the synonyms of the word parenting must be paranoia. I've always been the worrywart, but I've never been as anxious as when I became a parent. It all starts during pregnancy: Oh my gulay I forgot to take my folic acid supplement, does this mean the baby will be bobo? Then there's the newborn stage where you get up every 15 minutes to check if she's still breathing. Seriously speaking though, normal development is the thing that worries me the most. I don't pray for a smart kid, that's asking too much. Instead, I pray that her physical, mental, and emotional development is going along fine. Please Lord, no developmental delays or disabilities. We pray for a healthy, happy child. 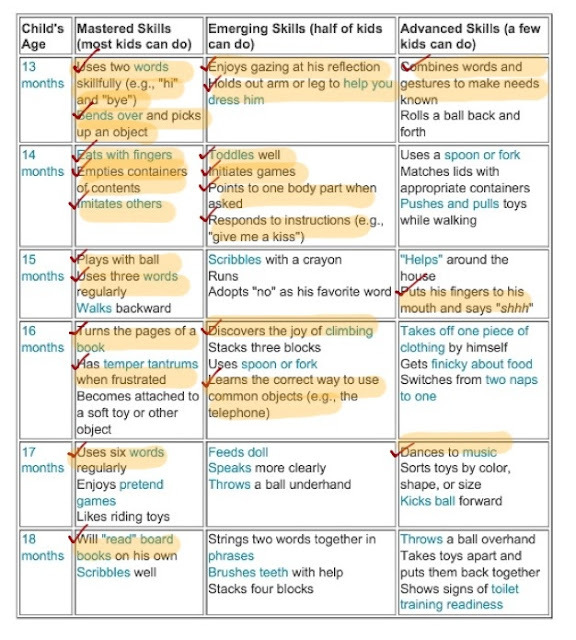 There's this checklist of milestones on www.babycenter.com that's helpful for keeping track of your child's development. 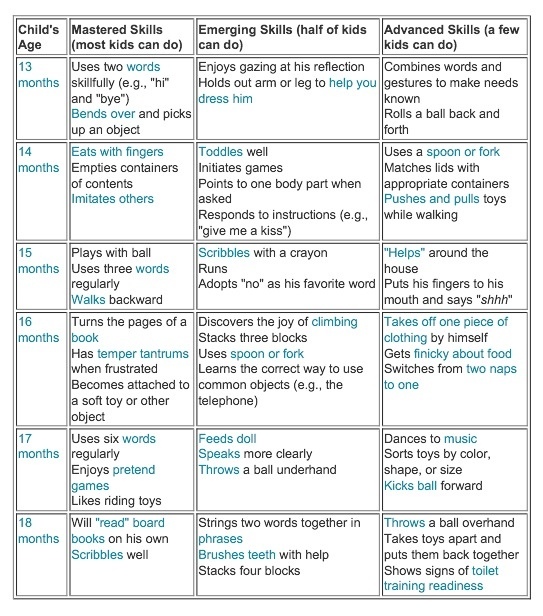 There are different stages, and the one above is the list for toddlers. I don't know how accurate this is, but it was prepared by pedias, developmental psychologists, and many other professionals. I tried to cross-reference different sources (Mayo Clinic, What to Expect book), and this looks pretty reliable. That's Ally's progress so far. Looks like her communication skills are pretty advanced. She's madaldal just like her mom (uhoh!). Her motor skills need improvement (I guess we have to play with balls more often), but as far as the chart is concerned, it's still normal. So we're pretty happy about her progress so far. Thank you Lord! So here comes another bout of paranoia. Just when you think you're in the safe zone, you find articles that talk about regression. One day they're fine, the next day they lose skills they've already learned. Pretty scary stuff! It pays to always be mindful of milestones, and check out lists like the one above. At the very least, you'll find out what to get excited for in the coming months! And more importantly, new research has shown that you can now detect signs of a developmental delay as early as 14 months old, as opposed to waiting for the 3rd birthday like recommended in previous years (read here). There is so much new information today that wasn't available many years ago. It's a good idea to read about these things once in a while. I know my post sounds gloomy when I should be celebrating about Ally's triumphs. Believe me, I am celebrating and doing a happy dance in my head! :) But I just wanted to take this opportunity to share the info with fellow parents. So check out the link above. The earlier you detect a problem, the earlier things can get better.